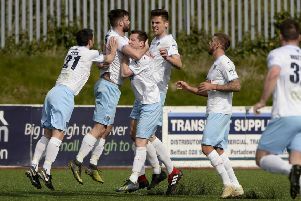 Ballymena manager David Jeffrey is convinced Cathair Friel and Johnny McMurray will offer the Sky Blues a cutting edge up front this season. Friel – signed from Limavady United in the summer – scored on Wednesday night as Ballymena drew 3-3 with Glenavon at the Showgrounds. Friel showed great craft and composure to slot the ball past Glenavon keeper Jonathan Tuffey, and before United travel to Ballinamallard United, Jeffrey believes he has uncovered a bit of a rough diamond. “A lot of people wandered why we went a signed a young boy from Limavady in Championship Two and we said to him that you are the very best you can be at that level or do you want to challenge yourself at a higher level? “And he had to work very hard in the first two weeks of preseason and it was tough. “But people can now see his quality. He was good on Saturday against Crusaders and he was even better against Glenavon. “I was very disappointed that McMurray had to come off against Glenavon and he is now touch and go for the Ballinamallard game. And Jeffrey expects a tight encounter against Ballinamallard on Saturday. “It’s traditional tough down there and we don’t seem to have done well done there in recent times but we will be looking to do better this time around,” added Jeffrey.